2-Free tea and coffee facilities. 3-Breakfast served in the rooms. All rooms are provided with free tea and coffee facilities. Also a hairdryer or iron are available on request. All rooms are equipped with colour TV. Continental Breakfast is always served in the rooms and is of course included in the price. Your luggage can be safely stored temporarily, if necessary. Our hotel has three floors without elevator. 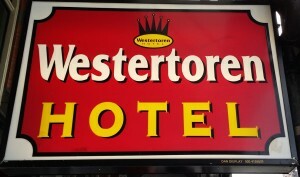 The hotel is located within two steps from Dam Square. Nearby our guests can find many different restaurants and bars, grocery stores, bank, post office, chemists and anything they might need. The Van Gogh Museum, the Royal Palace, the Rijksmuseum, The Anna Frank House and many other places of cultural interest are within short walking distance. Leidseplein and Rembrandtplein, ideal places to enjoy your Amsterdam’s night life, are pretty close to our property. Vondel Park is located at 10 minutes walk and it is the ideal place to relax and spend sometime breathing some fresh air.